A close up of the Flight Test Fixture II, mounted on the underside of the F-15B Aerodynamic Flight Facility aircraft. 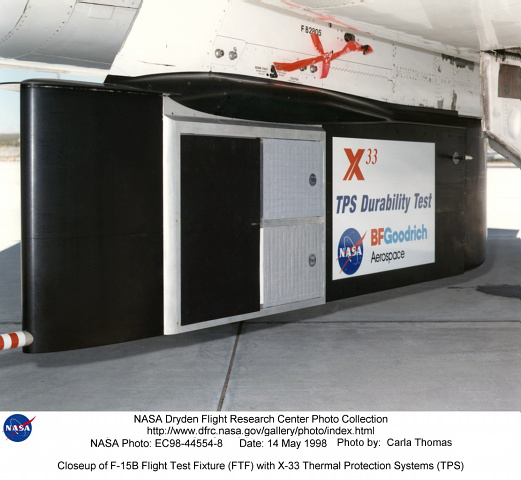 The Thermal Protection System (TPS) samples, which included metallic Inconel tiles, soft Advanced Flexible Reusable Surface Insulation tiles, and sealing materials, were attached to the forward-left side position of the test fixture. In-flight video from the aircraft's on-board video system, as well as chase aircraft photos and video footage, documented the condition of the TPS during flights. Surface pressures over the TPS was measured by thermocouples contained in instrumentation "islands," to document shear and shock loads.